Surveillance is one of the most challenging and difficult tasks that investigators frequently perform, especially after the events of September 11,th, 2001. That's because an increase in public awareness of surveillance practices in general has occurred. Every one hundred years or so, a manual is developed that becomes the national standard reference on a specific subject. On the subject of conducting a professional surveillance, we believe that you will find that Tactical Surveillance, The Investigator's Bible by Douglas J. Hagmann is that manual. Tactical Surveillance is a very comprehensive text that will appeal to new and veteran investigators alike. It is a field guide for the investigator, providing essential information, tips, and refreshing ideas that will aid in training the new surveillance investigator and assist the veteran investigator. You will not find any useless padding in this excellent work. Every page is brimming with clear, fresh and crisp references, tips, techniques, and know-how on conducting a tactical surveillance. This in depth bible is the very best manual on conducting a tactical surveillance published to date. The author has logged over 32,000 hours of surveillance and this bible reflects the high quality output and end product found in the author's work product. 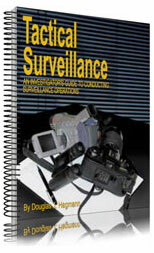 Thomas Investigative Publications, Inc. is very proud to offer to the private investigative profession this most outstanding manual by one of the leading surveillance investigators of our time. 8 1/2 X 11, wirebound so it lies flat when open for easy field reference. Photos, forms, checklists, illustrations, index, 140 pages.